The vision of branch libraries for the Ann Arbor Library system began with former Library Director Homer Chance. Recognizing the need for access to materials and facilities beyond the Downtown Library, Chance opened the first branch library in Ann Arbor - the Loving Branch - in 1965. In 1977 the West Branch opened its doors and the Northeast Branch began serving the community in 1981. In 1997, with a goal of providing superior public library services into the future, the Library embarked on a Facilities Need Analysis of the library system by consultant David Smith. His study found the three branch libraries severely lacking in square footage to meet current and future public needs. Using data gathered in surveys, on-site interviews, and estimates of projected material collection sizes in the year 2020, Smith’s study called for the construction of several larger branch libraries to serve the long-term community needs. 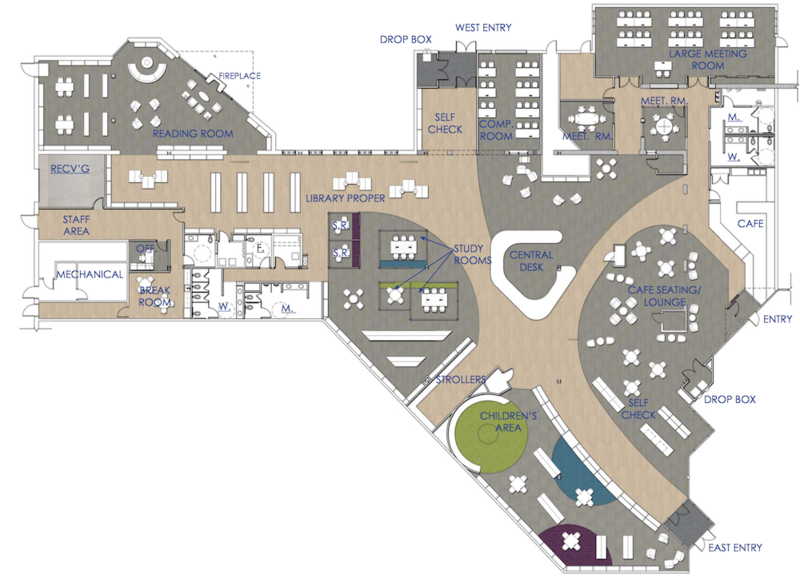 These would accommodate projected collection sizes and provide adequate meeting, event, storytime and teen spaces as well as areas for growing technology and staff work areas. Since 1997, the Library has been working toward the goal of creating these larger, more functional branches constructed within the Library’s current authorized millage. If you would like to donate to our building projects fund, you can do so on the Support AADL page or feel free to contact us with your suggestions or feedback. The Westgate Branch, the smallest and oldest of the Ann Arbor District Library branches, is about to expand. Although AADL Library services have increased and expanded over the last decade, Westgate Branch has not been remodeled for over 21 years. The branch originally opened in Maple Village Shopping Center in 1977, moved to Westgate Shopping Center in 1983 and was remodeled ten years later in 1994, adding 2,314 square feet. Westgate Branch, which currently has 5,500 square feet, is still approximately only 1/3 of the size of the other AADL branches. Its circulation figures match and even surpass some of the other branches, and the current Westgate space has no room for events and youth storytimes, popular and important features at all other locations. Read more about the Westgate Branch and follow the progress of the expansion. The current Downtown Library building consists of three different phases of construction: the original building built in 1957, a 1974 addition that doubled the size of that building, and a 1991 addition that doubled the building's size again. In 2007, the AADL hired library consultants PROVIDENCE Associates LLC to undertake a study examining the functions of this building and evaluating the building's feasibility for the next 20 years. The results of this study, which consisted of focus groups with over 100 users of the Downtown Library, led the AADL to begin the process of redesigning the Downtown Library. The findings of this study led the AADL Board to issue a Request for Qualifications for Architectural and Engineering Services that eventually resulted in the selection of Luckenbach">Ziegelman Architects, PLLC of Ann Arbor. A joint survey with the Downtown Development Authority in spring 2008 provided the AADL with feedback from over 6000 members of the Ann Arbor community about the future of the Downtown Library. This survey was followed in June 2008 with three public meetings, open to all members of the community, about the Downtown Library Project. In November 2008, the Library Board voted to suspend the Downtown Library Project as a result of the economic downturn. Read more about the Downtown Library Project. The Traverwood Branch Library, opened on June 30, 2008, is situated on 4.34 acres located in the southwest corner of Traverwood Drive and Huron Parkway in Ann Arbor. The Branch is a one-story building of approximately 16,500 square feet which replaced the Northeast Branch of AADL, located in Plymouth Mall. The Traverwood Branch serves as a community-based learning center that delivers superior customer service, primarily to the residents of the northeast quadrant of Ann Arbor. The library includes a casual study area, a laptop computer bar, four study rooms and a meeting room with seating for 90. Electronic resources include 24 public computer terminals, 20 of which are located in an Electronic Training classroom, and wireless internet access. Traverwood Branch is designed to have as little impact on natural landscape features as possible. Sustainable design features include an innovative stormwater management system and the reuse of harvested ash trees from the building site. A rain garden is located on the south side of the building. The design of the Branch takes advantage of natural day lighting. Read more about the Traverwood Branch or visit our image gallery to see architect's drawings and photos of the construction. Opened in March 2006, the Pittsfield Branch was designed to accommodate the needs of a library for a growing neighborhood while protecting the wetland on which it sits. The Pittsfield Branch is located on 5.74 acres of land on Oak Valley Drive in Pittsfield Township. It is a one-story building of approximately 14,600 square feet and is adjacent to the Ann Arbor Ice Cube arena. The Branch serves as a community-based learning center that delivers superior customer service, primarily to the residents of the southwest quadrant of Ann Arbor and Pittsfield Township. While its primary mission is to deliver traditional library services, the facility also includes a casual study area with vending and seating for 24 people and a meeting room for groups up to 100. The facility also houses a reading room for comfortable, leisurely reading, several quiet study and tutor rooms, and exhibit space for local artists and organizations. Electronic resources include 35 computer terminals, 18 of which are located in an Electronic Training classroom. The building and the surrounding landscape capitalize on environmental principles, thereby allowing the overall project to operate more in harmony with the ecosystem and the community in which it serves. Read more about the Pittsfield Branch or visit our image gallery to see photos and drawings of the building. Opened in January 2004, the Malletts Creek Branch is a unique model of sustainable design featuring solar heating, natural day lighting, a vegetated green roof, convection cooling, naturally captured and filtered storm water, native plants and grasses, and many uses of materials that are renewable resources. The Malletts Creek Branch was awarded the 2005 American Institute of Architects Michigan (AIA Michigan) Award for Sustainable Design. The Malletts Creek Branch is a one-story building of approximately 14,000 square feet that serves as a community-based learning center that delivers superior customer service, primarily to the residents of the southeast quadrant of Ann Arbor. It replaced the Loving Branch, which was no longer of adequate size to serve its customer base. While its primary mission is to deliver traditional library services, the Branch also serves as a true community. This facility includes a vending area with seating for 20 people and a program room for groups of up to 120 people. The branch contains a collection of approximately 35,500 items. Electronic resources include 28 computer terminals, 18 of which are located in an Electronic Training classroom. Read more about the Malletts Creek Branch or visit our image gallery to see photos and drawings of the building. The Westgate branch of the AADL will open on Tuesday, September 6 at 9:00 AM. We invite you to visit this newly renovated location, and to join us there for a public celebration on Sunday, September 18, at 12:00 PM. We will have music, food, and fun for all ages at this celebration of a new library in a familiar place. AADL Welcomes Sweetwaters Coffee & Tea to Westgate Branch! Library patrons will soon be able to enjoy a delicious cup of fresh coffee or tea as they browse new collections at the expanded Westgate Branch Library! Sweetwaters Coffee and Tea was founded in 1993 by Lisa and Wei Bee in downtown Ann Arbor. Both Wei and Lisa are UM graduates who decided to stay in Ann Arbor, continue their families’ hospitality tradition, and become a part of the Ann Arbor business community. Sweetwaters Coffee and Tea is a warm, comfortable, coffeehouse that offers a blend of traditional European espresso drinks, globally inspired beverages, beautiful Asian teas, delicious desserts, pastries, and savory treats. The new Westgate Branch expansion adds 16,500 square feet to create a branch with 21,000 square feet for its users. The Branch closed in late November and construction is now underway. Updates on this project can be found on the library website. For more information, visit westgate. Paolo Soleri whose signature architectural Arizona community combined his love of design with his passion for sustainability, has died. Soleri, a Frank Lloyd Wright apprentice, put his ideas about the cons of urban sprawl and the necessity for simplicity into practice by building Arcosanti in the Arizona desert. Using the principles of his coined beliefs, arcology (blending architecture with ecology), Soleri put them into practice at Arcosanti, his living laboratory located 67 miles north of Phoenix. The unique bee hive buildings in this compact community opened in 1970 and remains a viable neighborhood with more than 50,000 visitors every year. Soleri believed that, in order for nature to survive, the human population must minimize its footprint on the planet. Soleri envisioned 5000 residents at Arcosanti, but the actual population never exceeded more than a few hundred people. Some of the features of the buildings at Arcosanti are the use of concrete poured on site, ceramic tiles made on site, and a large patio that has 12-foot swinging glass doors that can be closed to accommodate the greenhouse effect. Soleri studied with Franklin Lloyd Wright, moving from Italy in 1947 to work with Wright at Taliesin West in Scottsdale, AZ. Soleri, who was 93, died yesterday and was buried at Arcosanti. We've been getting many questions about the upcoming Bond Proposal. We have put together this list of the most common questions and factual answers. Please don't hesitate to comment on this post or email us at downtown@aadl.org if you have further questions. Thanks for your interest in the library! What is the Downtown Library Bond Proposal? Residents of the Ann Arbor District Library service area will find a proposal for a bond to fund a project to replace the downtown library at the end of their November 6th ballot. If approved, the proposal will authorize the sale of up to $65 Million of bonds, and authorize the library to levy an annual property tax millage for up to 30 years to make the bond payments. Why is the Downtown Library Bond being proposed now? The current building will need major investment over the coming years to maintain or upgrade aging infrastructure. This will require increasing percentages of AADL's operating budget. With interest rates at unprecedented lows and construction costs still well below average, the AADL Board of Trustees determined that now is the time for the community to decide if a new downtown library should be built, or if AADL should continue investing operating funds in the current inefficient building. In 2007, the AADL board studied the issue of whether to replace or renovate the Downtown Library to address the capacity issues, and it was found that a new building would cost only 10% more than a renovation. Those cost estimates were assessed again in 2012 and found to be still valid. Why is the proposal for rebuilding a downtown library on the same site? AADL owns the site of the current downtown library, and it is by far the most heavily used public library in the district. AADL is committed to making information, events, workspace, and collections available downtown, and current demand for these services is beyond the capacity of the current building. The compromises involved in the previous two renovations to the current downtown library building are a major factor that limits the ability of a third renovation to add space and efficiency, so the AADL Board voted to place the bond proposal on the November 6 ballot to seek public approval for a new downtown library on the current site. The publicly-elected Board of Trustees of the Ann Arbor District Library is the sole body responsible for the project, services, and facilities of the AADL. AADL is an independent taxing authority, and the Downtown Library Project is not affiliated with the Ann Arbor Public Schools, the City of Ann Arbor, Washtenaw County, or any other governmental or commercial entities. How much will the project cost? What does that cost me? The bond proposal seeks authorization to sell up to $65 million of bonds to be repaid over 30 years. That is enough to fund the estimated $53 million of construction costs, plus demolition, rental of temporary facilities during construction, furniture, equipment, technology, and other costs related to the project including permits, architectural and interior design, and engineering. The library currently levies 1.55 mills per year for operation, costing the owner of a $200,000 home with a $100,000 taxable value $155 per year. When would the bond payments begin? If the proposal is approved by voters, the bonds would be sold in spring of 2013, and the millage would appear on tax bills starting summer 2013. If approved, what will happen to the Downtown Library? It is AADL's intent to have a downtown library open to the public throughout the process. If approved, when the current building closes, a temporary downtown library will open in a rented space offering request pickup, drop boxes, internet access, a kids' area, and popular materials, until the new building opens. AADL will not lay off staff during construction. The current downtown collection will be temporarily relocated and available by request as always during the construction process, and will be brought back into the new building before it opens. If approved, when would the project begin and end? A solid timeline will be developed if the proposal is approved, but it is anticipated that the project will begin by spring 2014 and construction will last 18-27 months. If approved, who would design and build the library? The AADL Board will select an architect and construction manager if the bond proposal is approved. AADL Board meetings, as always, are open to the public. If approved, how can the community give input on the design? In addition to the public forums seeking public feedback on the project that were held on June 9, 2012, June 12, 2012, and June 20, 2012, AADL will offer many opportunities for the public to give input and feedback on the design of the project as it progresses if approved. Similar events were held throughout the design process for the Malletts Creek, Pittsfield, and Traverwood branches, and the public is invited to speak to the AADL Board of Trustees at the beginning of every AADL board meeting. This evening the Library Board approved the bond language for a November 6, 2012 ballot proposal that would provide $65 million to fund the replacement of the Downtown Library at its current site at Fifth Avenue and William Street in Ann Arbor. The Board voted earlier in June to replace the Downtown Library, and now the bond language will be submitted to the Washtenaw County Clerk for inclusion on the ballot. Questions about this decision are centering around a few key issues. Those questions are answered in The Vision | The Vote. If your question is not contained here, please email downtown@aadl.org, and we will answer your question and post it to the Director's Blog so that it is widely available. 1. What will a new Downtown Library offer our community? 2. What will the new library look like? The Library Board has not commissioned any specific plans at this time. The Board is, however, using the work that was done and paid for in 2008 to develop a program for a 21st century library building in Ann Arbor. Even with ongoing changes in technologies, that building program is valid, and we are confident that replacing 110,000 square feet with 160,000 square feet will result in a building that reflects the increasing use of Ann Arbor’s Downtown Library with the flexibility to change spaces in the future without major renovations. The Board is asking the community to first decide if it is willing to invest $65 million. If we receive an affirmative answer from voters, then we would move onto the next step and select an architectural firm and a construction management firm. The Board considers this a prudent, fiscally conservative approach. 3. Is $65 million enough? Yes, it is. The bond amount covers every aspect of the proposed project, and the actual amount estimated to be spent on construction would necessarily be less than the total. In 2008, we estimated spending $334 per square foot on a new downtown facility. In the library’s experience managing construction projects, that cost per square foot is sufficient to deliver an outstanding facility. That these numbers hold true in today’s construction market is a very important factor in the Board’s decision to move forward with a bond proposal at this time. 4. Why can’t you just renovate the existing facility? The work that was done in 2007/2008 included a thorough review of many options that had been brought forward by staff and consultants. The architect and construction management firms at that time, with the Library Board and staff, concluded that two of the options provided the best opportunity to build a library building for the 21st century. One option was to replace the current building with a new 160,000 square foot facility and the other was to completely renovate the 1990’s portion and to replace the 1958 portion with a four-­‐story addition. It was determined through construction cost modeling that the renovation option cost would save less than 10% of the cost of a new facility. After careful consideration, the Board determined moving forward with a request for a new facility was a better return on the requested investment. 5. Why hasn’t the Library Board chosen to build the new library on the top of the underground parking garage on Library Lane? The Library Board considered this option in the 2007/2008 process and ruled it out for two major reasons. The first is that public library space is safest and most efficient when arranged on large floor plates with direct sight lines on each floor. The buildable space on the parking garage is too small to provide necessary large floor plates. The second reason is that the AADL owns the property at the corner of Fifth Avenue and William Street, and that property is zoned public land. In short, the parking garage space is too small, and we have more flexibility on property owned by the Library to build a facility that will meet the community’s needs in a public library space well into this century. 6. Why doesn’t the Library Board sell the property at Fifth and William and build elsewhere? The AADL owns the property at Fifth and William streets where the Downtown Library is located. However, in the separation agreement with the Ann Arbor Public Schools in 1995, the AAPS reserved the right of first refusal if the property was to be sold. The AAPS also has a year in which to make such a decision. In addition, the AAPS would pay only 65% of the estimated value of the property in such a sale, and if the AAPS chose not to purchase the property, but it was sold, the AAPS would receive 35% of the proceeds. The AADL Board has determined that this cost is too great to consider selling the site. 7. Are libraries needed in the age of EBooks and the Internet? EBooks and the Internet are a big part of why a new library is needed. The explosion of digital content has not decreased demand for library services; in fact, demand continues to grow, and that demand is increasing for new and different services. The current downtown building was not designed to accommodate, and cannot be retrofitted to enable, the delivery of 21st century library services. EBooks and the Internet have changed and expanded the demand that AADL enjoys and works to meet. A building built around warehousing one particular format no longer serves this community well. 8. How many people use the downtown library? • The Downtown Library averages over 600,000 annual visits, about 1,700 visitors per day. • The Downtown Library averages over 1,000,000 annual checkouts: 32% of total AADL checkouts. • The Downtown Library holds a collection of over 344,000 items, about 56% of AADL’s total collection. • The Downtown Library serves over 75,000 annual Internet sessions, about 30% of AADL’s total. • Since 2009, there has been a 21% increase in use of meeting rooms by outside organizations; 364 such uses, about one every day in 2011-­‐2012. 9. Why does the board think the public is interested in a new downtown library? In March of 2012, the Board commissioned EPIC­‐MRA to conduct a scientific telephone survey of district voters, looking to see whether the library was valued by voters, whether they thought the library was an important part of the community’s future, what they liked and disliked about the library today, and whether they would be willing to support building a new library. The survey showed that 45% of the respondents were willing to support a $65 million bond for a downtown library project. An additional 15% of the respondents said they would likely vote yes to such a bond. 10. What is wrong with the current building? The Ann Arbor District Library Board’s Facilities Committee reviewed the shortcomings of the current building, first constructed in 1958 and updated twice, most recently in 1990. After reviewing renovation possibilities, the committee determined that a new facility built on the site of the existing building was the most cost-­‐effective solution. 11. Where can I give my feedback? Questions are important and helpful as the Board and staff move through this very important phase in the Library’s history. Video of each of the three forums, held on June 9, 2012, June 12, 2012, and June 20, 2012, and a summary of the feedback from the public are available on the Director's Blog. Send your questions to downtown@aadl.org. All questions will be addressed and answers posted to the Director's Blog. 1. What is a bond proposal? A bond proposal is a request by the Library Board for voters to approve the sale of bonds, which will raise funds to build a new downtown library. 2. Why is a bond proposal necessary? In 1994, in response to law passed in the legislature, the Ann Arbor Public Schools could no longer fund the operation of a public library with school millage. The AAPS and the City of Ann Arbor then established the Ann Arbor District Library in accordance with this new legislation. The Library is not connected in any way with the budgets of the Ann Arbor Public Schools or the City of Ann Arbor. The Library is a completely separate institution with an elected governing Board of Trustees. In 1994, the voters approved the establishment of the district library, and at the same time approved a millage of 2.0 mills in perpetuity to fund the operations of the Ann Arbor District Library. Today, the Library could levy up to 1.92 mills. Due to the improved technologies and choices made by the Library to use all of our resources to return an investment to the taxpayer, the levy is now 1.55. The current difference between 1.55 and 1.92 is $1.6 million, and that is not enough to fund a project of this magnitude. 3. What is on the November 6, 2012 ballot? Shall the Ann Arbor District Library, formed by the Ann Arbor Public Schools and the City of Ann Arbor, County of Washtenaw, State of Michigan, borrow the sum of not to exceed sixty-­‐five million dollars ($65,000,000) and issue its general obligation unlimited tax bonds, in one or more series, payable in not to exceed thirty (30) years from the date of issuance of such bonds, for the purpose of paying all or part of the costs of constructing, furnishing and equipping a new main library building to be located at the current site of the downtown library building, including costs related thereto? The estimated millage to be levied in 2013 to pay the debt service on such bonds is 0.56 mills ($0.56 per $1,000 of taxable value). In accordance with State law, a portion of the revenue collected may be subject to capture by the City of Ann Arbor Downtown Development Authority and the Scio Township Downtown Development Authority. 4. Who can vote in this election? Registered voters in the Ann Arbor District Library district boundaries can vote on this proposal. That includes all of the City of Ann Arbor and parts of Ann Arbor, Lodi, Webster, Pittsfield, Superior, Salem, and Scio townships. 5. Why did you put this on the November ballot? This is the election when turnout tends to be highest. We wanted to give everyone an opportunity to express his/her view through the ballot box. 6. How much will the proposal cost the average taxpayer? If the bond proposal is approved a property owner’s taxes will be increased by approximately 0.56 mills. Property owners can use the following home value samples to determine their estimated individual tax increases. 7. If the ballot issue passes, when will property taxes be levied? If the bond proposal passed on November 6, 2012, the first tax levy related to the bond would be in July 2013. 8. Where and when can I register to vote? You may register in person with your city, township, county clerk or any Secretary of State office. You may also download printable voter registration forms here. Please follow the instructions carefully. For polling locations, visit this page. 9. What are the key dates coming up for the election? The election is November 6, 2012. To vote, you need to be registered by October 9, 2012. No date has been given yet for when absentee ballots will be available. Absentee ballots are usually available about six weeks before the election, which would be about mid-­‐September. At last evening’s Board meeting, the Board of AADL voted unanimously to place a bond proposal on the November 6, 2012 ballot for $65 million to replace the Downtown Library at its current location. Attached are the Library Board's resolution, press release, the Facilities Committee's recommendation, and some Downtown Library Facts & Figures. The Board will meet on Monday, July 30 at 7:00 PM to approve the language for the ballot. We appreciate the questions, feedback and the attendance of so many of you through this website, and at the community forums held earlier this summer. Your questions are important and helpful as the Board and staff moves through this very important phase in our Library’s history. Video of each of the three forums, held on June 9, 2012, June 12, 2012, and June 20, 2012, and a summary of the feedback from the public is available on the Director's Blog. You may use this blog or send your questions to downtown@aadl.org. All questions will be addressed and answers posted to this blog. The third community forum to discuss the future of the downtown library was held on Wednesday, June 20. The video of the third forum is posted below, and the others are available on the previous posts on this blog. In addition, the feedback from the information stations at all three events have been collected and are included at the end of this post. The Library Board and staff appreciate that so many individuals have taken up this discussion with a keen interest. Comments can be posted to this blog, or sent to downtown@aadl.org. We will acknowledge all communications by posting them on this blog. The Library Board meets next on Monday, July 16, at 7:00 PM in the 4th Floor Board Room of the Downtown Library. A public comment period precedes the regular meeting and is a part of the Library Board agenda each month. All are welcome, and encouraged, to attend. •	Board – Decision making process? •	Building in Northwest quadrant of service area? •	How does technology factor into the renovation vs. new building question? •	How do energy and water needs fit into the Downtown building question? •	Economy: How do economic changes factor in? In this climate how do you “sell” changes to Downtown building? •	What would the timeline be in the case that a bond passed? •	Can you bridge the library to the parking lot and build 2 or 3 stories up? •	Does the Board have a commitment to build a library that reflects the intellectual and cultural sophistication of the A2 community? •	Can you add space on the footprint? •	Does $65 million include moving, etc.? •	What is your track record on over-runs? •	What would the cost be to rebuild just the 4th story section of the current building? •	Can some portion of the current building (newer portion) be kept and renovated? •	NOT environmentally sound to tear down such a new building as AADL. •	How is a library different from a cultural/community center – or isn’t it? •	What’s the gap between what we’re able to do now and what we perceive the need will be in the future? •	Has there been any consideration of changing the site? •	What will happen to service while construction is taking place? •	Do the library board and leadership have an opinion about what should happen with the city property next door? •	When considering renovation, how extensive was the consideration? •	If there’s less need for space for stacks, is there a need or what is the need for greater square feet than what we have? •	Do we see serving the underserved/homeless as part of the equation and how, when considering the future? •	Why isn’t the library protecting TIFF money more aggressively? •	Why can’t an architectural plan be set forth for the public before going for a bond? •	Need flexibility to be ready for the changes to come. Even if we don’t know what the change will be, we know there will be change. •	Is $65 million enough? •	Multi-use: laptops, books, maps, etc. •	Comfortable chairs – used for longer time. •	Comfortable chairs for browsing, reading on laptops and tables, etc. •	More free meeting spaces for community groups of 6-20 people would make the library a more important community center and of greater value to the community, e.g., the Arab American Parent support group would like to meet in the library but often cannot – so we meet elsewhere. •	Why does it fall to library to be meeting space? •	Why is there no other civic gathering space? •	Cost of gathering spaces? •	If I sit in back of a room, it is hard to see; raise/angled seating cost? •	Friends space – more! •	Will a new library affect the branches? •	Take pressure off of DTN by opening another branch – Borders at Arborland? •	If there is a building on top of the parking lot next door, connect DTN to it via a walkway. Parking below and offices/library above. Could rent out extra space. •	Put archives, IT, mechanical in large basement with access from library lot, elevators. •	Please do not tear own the original Alden Dow-designed part of the building. Could it be incorporated into a new design? •	Helping people efficiently navigate their way in the vast amount of information potentially available to them from the web will be very important, e.g., how do I find the best apps to link my iPhone to my laptop so I have access to my computer files from my phone. The second community forum to discuss the future of the downtown library was held Tuesday, June 12 from 7:00 -8:45 PM in the Multipurpose Room at the Downtown Library. We appreciate those who have chosen to spend time talking with us about 21st century library service at the forums held on June 9 and June 12. The third forum will be held Wednesday, June 20, from 7:00 - 8:45 PM in the 4th Floor Meeting Room of the Downtown Library. I am including the agenda and the content of our information boards, along with this video of the discussion in this message. This update also includes a video tour of some of the non-public areas of the downtown library. Tours will also be available to those attending the forum on June 20, however, the tour is not accessible. For those of you unable to attend, please don't hesitate to send your comments, questions or concerns to downtown@aadl.org or comment on this post. All questions and answers will be posted on the Director’s blog. - A $65 million dollar bond will provide funds to improve the Downtown Library, allowing AADL to continue to function within the existing operating millage.